Read Excerpts from "The White Mary"
Comments from Readers about the "The White Mary"
"The White Mary is a rare must-read. Kira Salak is not afraid of the biggest emotions, which she handles with a deft and assured touch. There aren't many books that we hand to friends, urging, 'You have to read this.' The White Mary is one of them." "There are echoes of Heart of Darkness in this riveting novel about a globe-trotting American journalist’s attempt to track down a Pulitzer Prize-winning correspondent who is supposed to have committed suicide in New Guinea but is rumored to be alive. . . [Salak’s] first-hand knowledge of jungle life there yields many harrowing, unforgettable passages." "A young reporter embarks on a dangerous adventure in Salak's gripping debut novel, a blend of Heart of Darkness and Tomb Raider. Like her protagonist, Marika Vecera, award-winning journalist Salak has traveled solo--and narrowly escaped death--in the world's most remote and terrifying places." "One cannot write well about people risking their lives without having done it oneself; suffice it to say that Kira Salak is profoundly convincing on the topic. Salak's got it: That ability to capture the world in all its beauty and darkness and violence without romanticizing it. This is a book borne of the years that Salak spent as a journalist and traveler in some of the most terrifying places in the world, but she has held on to her basic humanity through it all. That essential humanity is what elevates The White Mary--and all of Salak's work--from mere 'adventure writing' to true literature. The reader is changed by it--changed in the same way Salak must have been, many times over, in the writing of it. This is a truly inspiring book about the kind of place I have spent many years reporting from. There is no doubt: She nailed it." "As Vecera cuts her way through swamps and forests, encountering snakes, insects, and the native population along the way, you'll think of the travails of Katharine Hepburn in The African Queen." 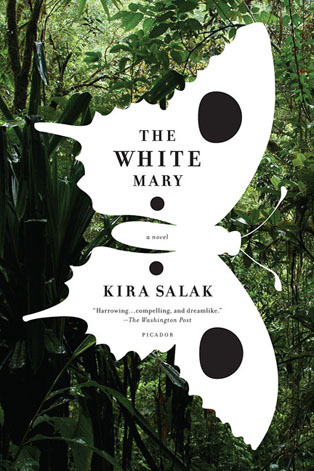 "With The White Mary, journalist Kira Salak makes a stunning debut as a novelist. This is a story whose beauty and power sweeps you along, like the jungle rivers that bear her heroine into the heart of New Guinea in search of a vanished American. In the tradition of Joseph Conrad's Lord Jim and Graham Greene's The Heart of the Matter, The White Mary is a superb adventure tale that explores the human soul, a tale of a physical journey that frames a spiritual quest for love and meaning in a world sadly deficient in both." "Salak's description of the sights, sounds, and smells of the jungle, with its brutal chieftans and servile women, brings the story to life with all of its horrors and satisfaction." "Marika Vecera is a freelance correspondent, available to cover all the world’s wars and atrocities, hooked on the danger and anguished thrill of bringing news of incredible inhumanities to safer parts of the world.... [She] comes face-to-face with her own fears in the harshest test of faith and her ability to survive. Salak, herself a war correspondent, brings to life the incredible internal struggles for witnesses and reporters of war atrocities." Read the "The Wall Street Journal" Review of "The White Mary"
Read the "National Geographic Adventure" Review of "The White Mary"
Marika Vecera, an accomplished war reporter, has dedicated her life to helping the world's oppressed and forgotten. When not on one of her dangerous assignments, she lives in Boston, exploring a new relationship with Seb, a psychologist who offers her glimpses of a better world. Returning from a harrowing assignment in the Congo where she was kidnapped by rebel soldiers, Marika learns that a man she has always admired from afar, Pulitzer-winning war correspondent Robert Lewis, has committed suicide. Stunned, she abandons her magazine work to write Lewis's biography, settling down with Seb as their intimacy grows. But when Marika finds a curious letter from a missionary claiming to have seen Lewis in the remote jungle of Papua New Guinea, she has to wonder, What if Lewis isn't dead? Marika soon leaves Seb to embark on her ultimate journey in one of the world's most exotic and unknown lands. Through her eyes we experience the harsh realities of jungle travel, embrace the mythology of native tribes, and receive the special wisdom of Tobo, a witch doctor and sage, as we follow her extraordinary quest to learn the truth about Lewis--and about herself, along the way.